As the McGrath Clan Gathering draws closer, the organizers are delighted to announce the speakers for the Clan Weekend. They are John Cunningham from Fermanagh, who is the top speaker in the country on the McGrath Clan. Local historian Willie Fraher, Dan McGrath, Sean McGrath, Seamus Mac Craith and genealogist, Tony Hennessy. They may be an additions to this list. 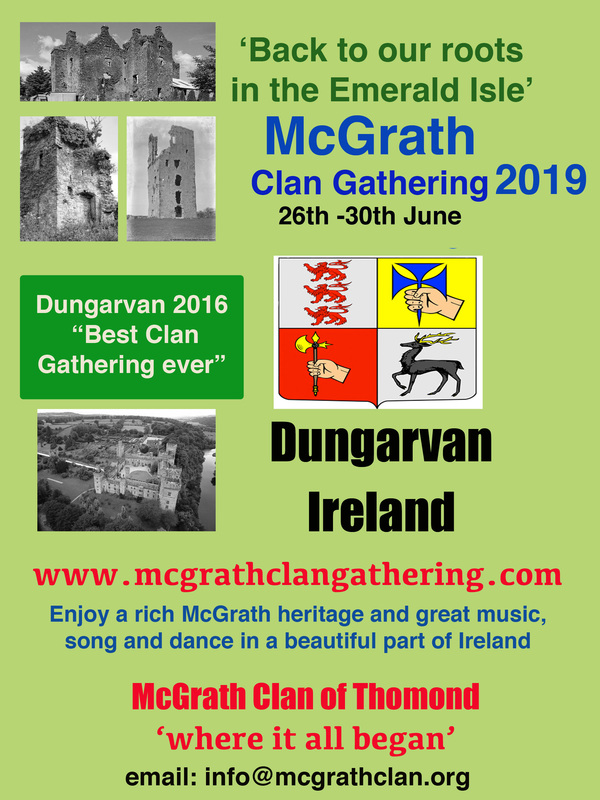 Four days of activities have been planned for Dungarvan, which was one of the McGrath strongholds, in mid June. They include two day trips to places of interest, including some McGrath Castles. Four Nights of excellent traditional music, talks on both friday night and Saturday morning, plus a Clan Dinner. Sunday will start with mass in Abbeyside church, followed by either golf or a walking tour of the town. The weekend will end with a wrap party in Tigh an Cheoil. http://www.mcgrathclangatherind.com for more information. This entry was posted in Uncategorized on April 9, 2013 by McGrath Clan (official).